Your local Credit Union History, how it all started…. History of Carrickbrennan Credit Union Ltd.
Carrickbrennan Credit Union Ltd. was first formed by a number of local people in October 1970. as the initial meeting to discuss the proposed new Credit Union was held over a shop on the Carrickbrennan Road, it was decided to na,e the new venture Carrickbrennan Credit Union. By October 1980 membership had reached 1,740 Members. In 1984, as membership was growing steadily, the Credit Union acquired new premises in Credit Union House on Monkstown Farm, extended the opening hours and became affiliated to the Irish League of Credit Unions. By 1988 the first computer was introduced to the Credit Union from a company named BEE to help with Member accounts, and from there on the computers have continued to be upgraded with different suppliers. Since its inception, nearly 9,000 Members have been welcomed by Carrickbrennan Credit Union Ltd. Through the time and dedication of all the founder voluntary directors, Carrickbrennan Credit Union Ltd. has become the establishment it is today. History of Dalkey Credit Union Ltd. In 1967 a group of local people met to discuss the idea of forming a Credit Union. After numerous discussions a public meeting was held in 1968 in the Coliemore Hotel to discuss the possibility of starting a Credit Union and a committee was elected to pursue the idea. After much hard work Dalkey Credit Union Ltd was formally registered with the Registrar of Friendly Societies in May 1969. Our Lady’s Hall on Castle Street was the first base of operation for the Dalkey Credit Union and shortly after a move was made to 13a Castle Street. Unfortunately, soon after that a Dangerous Building notice was served requesting the Credit Union to vacate the premises and make a temporary move to a cottage beside the Ulster Bank on the main street. After a few years renting a premises above Doyles Butchers shop, the Credit Union returned to the newly refurbished 13a Castle Street and in 1981 Dalkey Credit Union purchased the property in which it has remained since. Since its foundation, over 7,000 people have opened accounts and over €60m has been lent to the Members of Dalkey Credit Union. History of Foxrock & District Credit Union Ltd. The first meeting to consider the feasibility of establishing a Credit Union in the Foxrock and surrounding areas was held on the 8th December 1987. This and subsequent meetings were followed by a research questionnaire in the area and a nine month study group, held weekly in facilities made available by the Community Center Foxrock Church. In due course the Credit Union and its common bond area were registered with the Irish League of Credit Unions and the Registrar of Friendly Societies in April 1989 and opened for business on the 13th May 1989, in the Community Center Foxrock Church. The initial opening hours were 6.30pm – 8.00pm on Thursday evenings ans 10.00am to 12.30pm on Saturday mornings. At the start all records were maintained manually by a team of volunteers, but due to the steady expansion of the Credit Union the records were computerized in 1993. 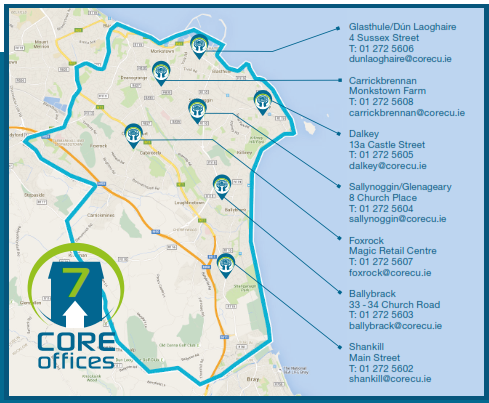 In 2004 following 15 years of steady growth the Credit Union transferred its operations to new premises in Cornelscourt and in 2006 the common bond area of the Credit Union was extended. Up to the merger with Core Credit Union Ltd in May 2016, Foxrock & District Credit Union had welcomed over 4,200 Members and over the years it has advanced €28.3m in loans to its Members. History of Glasthule Dún Laoghaire District Credit Union Ltd. The first meeting of the proposed Glasthule Dún Laoghaire District Credit Union Ltd. was held on Tuesday the 7th of April, 1970 in the Christian Institute on Upper Georges Street, Dún Laoghaire. As a result, Glasthule Dún Laoghaire District Credit Union Ltd.was registered on the 17th of June 1970. Over time Glasthule Dún Laoghaire District Credit Union Ltd. moved from various locations throughout the town to settle, finally, in number 4 Sussex Street, in the 1980’s. There was rapid expansion in the early days and the Board of Directors decided to purchase numbers 1,2 and 3 Sussex Street to create a larger office while keeping the original facade. In July 2003, the newly created premises was opened and the new building won the 2003 Dublin Regional Best Shop aware and the 2003 National Best Shopfront Award. Over the years Glasthule Dún Laoghaire District Credit Union Ltd. has welcomed over 11,000 members. History of Sallynoggin/Glenageary Credit Union Ltd. Prompted by concerns raised by the local conference of the St. Vincent De Paul Society regarding money lending in the area, a group of residents organised a meeting to discuss the problem. This eventually led to the establishment of Sallynoggin/Glenageary Credit Union Ltd. In June 1967 the Credit Union opened for business in St. Kevin’s School on Friday evenings and Sunday mornings. By 1969 over 1,000 applications for membership had been received and it was decided to purchase 8 Church Place, Sallynoggin. To help defray costs the shop portion of the premises (O’Grady’s) was converted into a dry cleaners/launderette and leased to Parnell Cleaners. The Credit Union operated from a small back cash office and the upstairs of the building. Over the following years the building was renovated and expanded first in 1987 and then a major refurbishment in 2000, resulting in our present office. To date Sallynoggin / Glenageary Credit Union Ltd. has welcomed over 11,000 Members and lent out in excess of €82m. History of Shankill, Ballybrack & District Credit Union Ltd. In 1965 four local men first had the notion of forming a Credit Union in Shankill, as they were unable to become Members of Bray Credit Union Ltd. because they did not live in the Bray area. Subsequently, Shankill Credit Union Ltd was registered in early 1966 and opened for business in St Anne’s hall on Sunday mornings. Opening hours changed to Friday nights and membership grew steadily so that by the end of the first year savings totalled £683, and outstanding loans to members totalled £521. In 1970 Shankill Credit Union Ltd borrowed £1,500 from Bray Credit Union Ltd and purchased Virginia Cottage. The following year it was decided to open a branch office in Ballybrack operating first from the Columban Hall, then the Workman’s Club and later St. John’s Girls School. By now membership had grown to over 300 with £17,000 in savings. In 1986 the Credit Union purchased premises at 33 Church Road, Ballybrack and this time we didn’t need to borrow! In 1989 our next step was computerisation and this has proved a great success in improving our services to Members. In 2014 Shankill, Ballybrack & District Credit Union welcomed their 10,000th Member. These six Credit Unions now form Core Credit Union Ltd., a Credit Union with 35,000 Members, €140m in assets, €45m in loans, €75m available to lend and 45 local employees.